Supreme Court in Shatrughan Chauhan Vs. Union of India Case has concluded that inordinate delay in the rejection of mercy petitions of death row convicts amounted to torture and that it is a sufficient basis, in and of itself, to commute a sentence of death to life imprisonment. Capital punishment or the death penalty is a legal process whereby a person is put to death (by Hanging, in India) by the state as a punishment for a crime. What is the problem with the current Rarest of Rare Case Doctrine ? Death penalty can only be awarded in the “rarest of the rare” cases ("Gravest cases, Extreme Culpability, where the option of life imprisonment is unquestionably foreclosed"). In words of Supreme Court " Life Imprisonment is Rule while Death Penalty is exception". But since there is no statutory definition of what rarest of rare means, the debate on each death sentence punishment rages on. He can pardon, reprive, respite, remit, suspend or commute a death sentence. He is the only authority to pardon a death sentence. He cannot pardon a death sentence. Even if a state law prescribes for death sentence, the power to grant pardon les with the President and not the Governor. But the Governor can suspend, remit or commute a death sentence. He does not possess any such power. What is the Rarest of Rare Case then? merely the death of the victim or murder charges do not qualify a case as rarest of the rare. The court takes into consideration both aggravating and mitigating circumstances, a line of thought that has developed over the years in various judicial pronouncements. Capital punishment could be awarded when a “murder is committed in an extremely brutal, grotesque, diabolical, revolting or dastardly manner so as to arouse intense and extreme indignation of the community. If the motive betrays depravity and meanness, or if a backward or minority community member is killed not for personal reasons but to arouse social wrath, the accused should get death, it added. Other crimes which technically fall into the rarest of rare cases are bride burnings and dowry deaths, a child victim, the assassination of a public figure for political reasons, or killing a defenceless person because of old age or infirmity. there is some ambiguity that remains about what constitutes a rarest of rare case. The subjectivity of each judge remains a factor, as does the reactions around the case - whether the public outrage to the Delhi gangrape was a factor in the verdict is a question which arises in this context. The question of death penalty is not free from the subjective element and the confirmation of death sentence or its commutation by this court depends a good deal on the personal predilection of the judges constituting the bench. What happened prior to this judgement? Prior to this judgment, it was well settled that once the courts have awarded the death sentence in the “rarest of rare” cases, the process surrounding the execution of the sentence is entirely in the domain of the executive, with any reform of this process on humanitarian grounds being left to the wisdom of Parliament. But the status quo has been challenged quite effectively in this landmark judgment. What are the methods of Capital Punishment? Beheading typically refers to the act of intentional decapitation, e.g., as a means of murder or execution; it may be accomplished, for example, with an axe, sword, knife, wire, or by other more sophisticated means such as a guillotine. Execution by electrocution, usually performed using an electric chair, is an execution method originating in the United States in which the condemned person is strapped to a specially built wooden chair and electrocuted through electrodes placed on the body. A gas chamber is an apparatus for killing humans or animals with gas, consisting of a sealed chamber into which a poisonous or asphyxiant gas is introduced. The most commonly used poisonous agent is hydrogen cyanide; carbon dioxide and carbon monoxide have also been used. Lethal injection is the practice of injecting a person with a fatal dose of drugs (typically a barbiturate, paralytic, and potassium solution) for the express purpose of causing immediate death. It kills the person by first putting the person to sleep, and then stopping the breathing and heart, in that order. Execution by shooting is a form of capital punishment whereby an executed person is shot by one or more firearms. For the record, Capital Punishment has been converted to humanising capital punishment i.e. there would be no delay in the clemency petitions. Capital punishment is rarely awarded in India but it will be awarded if the case is “rarest of the rare”. Note: Data is as per January 2014. What Supreme Court has said? Keeping a convict in suspense while consideration of his mercy petition by the President for many years is certainly an agony for him/her. It creates adverse physical conditions and psychological stresses on the convict under sentence of death. Indisputably, this Court, while considering the rejection of the clemency petition by the President, under Article 32 read with Article 21 of the Constitution, cannot excuse the agonizing delay caused to the convict only on the basis of the gravity of the crime. 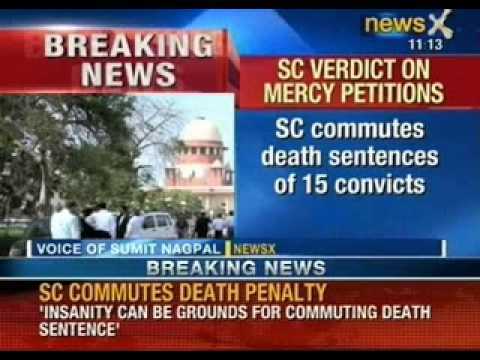 if there is undue, unexplained and inordinate delay in execution due to pendency of mercy petitions or the executive as well as the constitutional authorities have failed to take note of/consider the relevant aspects, this Court is well within its powers under Article 32 to hear the grievance of the convict and commute the death sentence into life imprisonment on this ground alone. This provides guidance to the executive in relation to the exercise of the powers of pardon, and a failure to adhere to this guidance will lead to the decision-making process being subject to judicial review so as to ensure that it was not in any way arbitrary. Whether the delay be allowed if the case involved is having high crime gravity (i.e. the case is of a heinous crime)? Supreme Court said that all death sentences imposed are impliedly the most heinous and barbaric and rarest of its kind. The legal effect of the extraordinary depravity of the offence exhausts itself when the Court sentences the person to death for that offence. Law does not prescribe an additional period of imprisonment in addition to the sentence of death for any such exceptional depravity involved in the offence. Supreme Court is of the view that unexplained delay is one of the grounds for commutation of sentence of death into life imprisonment in all types of cases including the offences under TADA. This is indeed a significant part of the judgment as the brutality of the crime is often put forth as an argument for undermining the constitutionally protected rights of those sentenced to death. What doctrine is followed for the power of Pardon? “Fair, just and reasonable” doctrine is followed. The judgment emphasises the need for accountability in exercising constitutionally enshrined powers in a responsible manner. Moratorium on Death Penalty means A legally authorized postponement for the death penalty to be carried out. For greater accountability in the process of both the imposition and execution of the death penalty is to have a moratorium for a fixed period of time. During this moratorium, a systematic analysis of the death penalty as a form of punishment may be undertaken with the necessary empirical evidence on its implications for crime prevention, deterrence as well as other objectives that are pursued for retaining capital punishment on the statute books. What United Nations has to say about the Moratorium? U.N. General Assembly adopted resolution on December 2012 calling for a moratorium on the death penalty with the ultimate objective of its universal abolition. This was adopted by a record 111 member states, a feat that once again reiterates growing international consensus relating to the abolition of the death penalty. The Supreme Court’s recent judgment is indeed a first and important step towards humanising the implementation of capital punishment. It creates new forms of the accountability of the executive at all stages of the pardon process, right from the level of the Ministry of Home Affairs all the way up to the office of the President of India. It will no longer be possible for the executive to give excuses for the delay in taking a decision on pardon petitions. What about abolition of Capital Punishment? Indian democracy needs to move towards abolishing the death penalty as a form of punishment for all offences. Civilised societies cannot retain the death penalty for any offence and enough empirical evidence is available from around the world to support the view that the death penalty cannot be administered in a manner that does not attract some form of injustice. But it is a matter of debate whether India as a society is ready for abolition of capital punishment considering the day by day increasing crime rate in India. The Court has extensively referred to its expanding and evolving jurisprudence under Article 21, thereby committing itself to the deeper values of constitutionalism embedded in the provisions relating to the fundamental rights enshrined in the Constitution. The values of constitutionalism are not shaped by the exigencies of current situations, political considerations or, for that matter, public perception; they are based upon a deeper commitment to the societal values that are inherent in the Constitution. What are Human Right Activist Saying about the Supreme Court Judgement? The apex court’s ruling was a ray of hope to human rights activists who hope to abolish capital punishment in India. It acts as deterrence to the general public. It is type of “revenge” instrument that is used by the family of person who has died or is badly injured for taking revenge from the culprit for his offence. It is good for the society considering its long term benefits. It is less costly than the life imprisonment. Innocence and the Death Penalty: The wrongful execution of an innocent person is an injustice that can never be rectified. Death Penalty Can Prolong Suffering for Victims' Families: Many family members who have lost love ones to murder feel that the death penalty will not heal their wounds nor will it end their pain; the extended legal process prior to executions can prolong the agony experienced by the victims' families. 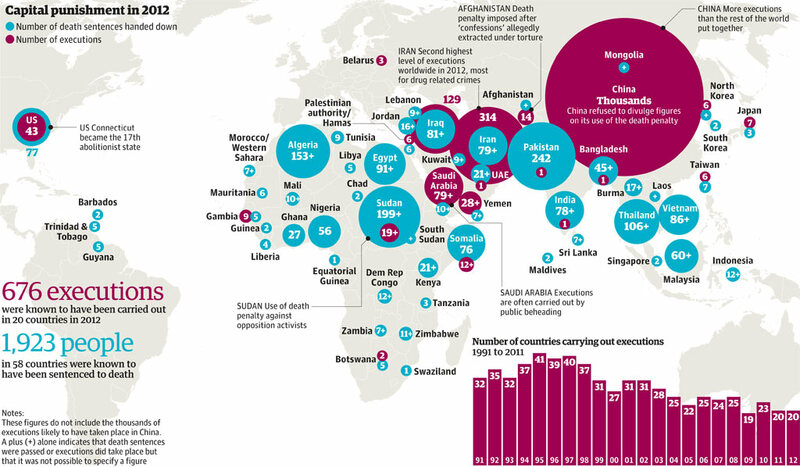 International Views on the Death Penalty: The vast majority of countries in Western Europe, North America and South America - more than 139 nations worldwide - have abandoned capital punishment in law or in practice. Inadequate Legal Representation: Perhaps the most important factor in determining whether a defendant will receive the death penalty is the quality of the representation he or she is provided. Deterrence: Scientific studies have consistently failed to demonstrate that executions deter people from committing crime anymore than long prison sentences. Arbitrariness in the Application of the Death Penalty: Politics, quality of legal counsel and the jurisdiction where a crime is committed are more often the determining factors in a death penalty case than the facts of the crime itself. Religious Perspectives on the Death Penalty: Although isolated passages of religious scripture have been quoted in support of the death penalty, almost all religious groups in India regard executions as immoral. Alternatives to the Death Penalty: In every state that retains the death penalty, jurors have the option of sentencing convicted capital murderers to life in prison without the possibility of parole. The sentence is cheaper to tax-payers and keeps violent offenders off the streets for good. Why the power of President to commute death penalty should be abolished? The power to grant clemency is a relic of monarchy. A monarch could overrule the judiciary in a rare mood of magnanimity in a deserving case though in the process he would be trivializing the judiciary because it is only the courts that can go into the minutiae of issues involved including the adequacy and reliability of evidences. Why have we continued with the clemency power with its dubious potential, the one which all said and done conflicts with judicial conclusions? It is well known that the Home Ministry which processes the mercy petitions addressed to the President is often torn between the need for justice and political considerations---the Rajiv killers’ petitions being cases in point. The truth is there is no reason why this feudal power should continue to be on our statute. In fact it would be in politicians’ interest if they amend the constitution to remove these two articles because in that event there won’t be any mercy petitions; ergo no delay in disposing them off. They would attract to flak, with the judiciary manfully bearing the brunt when the death sentence is criticized as too harsh in the circumstances of the case. Abolishing death sentence would amount to throwing the baby with bath water but abolition of the Presidential power to grant clemency would amount only to throwing the bathwater with the baby intact.